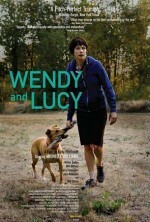 Unquestionably the best film I have had the pleasure to catch at the Festival so far, Wendy and Lucy is a work of riveting drama and touching humanity. Michelle Williams, all anxiousness and trembling desperation in a ragged black pixie cut, stars as Wendy, a young woman drifting her way to Alaska in search of work. Her companion is a frisky mutt, Lucy, to whom Wendy exhibits a profound and obsessive devotion that will be familiar to any pet owner. Eschewing a soundtrack or a dribble of unnecessary exposition, Wendy and Lucy portrays a few days of the companions' tribulations in small-town Oregon, where a cascade of bad luck threatens their future together. Williams, who is essentially on screen for the entire running time, mesmerizes in a portrayal simmering with weariness, terror, and directionless anger. Employing a breathtaking, chafed naturalism, director Kelly Reichardt expertly conveys the despair of life on the American margins, where vagrancy is criminalized and loose change is tallied like the remaining days of a prison sentence. Earning every spasm of heartache with her genuine depiction of life's casual cruelties, Reichardt captures a wrenching picture of the sacrifices we all make for those we love.